I have talked lengths about Windows Phones earlier as well and in particular about Nokia Lumia 510 too. This time, I wanted to take the space for the favorite feature of mine in Windows Phones: Nokia Drive. I warn you, this wont be a conventional Layman’s take post but the one shot written rumbling of the man Nitish Kumar. So be ready to take it that way. Before starting about Nokia Drive, let me tell you that I am very bad with routes, which some of you already have gotten a clue about, since I am stressing about Nokia Drive here. I have had bad moments due to guess works about the routes and started relying over maps even when I wasn’t travelling by car and had a Nokia N70 with me. The people who follow me on twitter or facebook, would sure remember that how it was just sometimes back when I started learning the car driving and later on bought one. One thing about new drivers like me. We just hate getting lost in routes. I mean think you are going to meet a friend, have a address in hands, then you also prepare yourself in advance by looking at web maps that what route it would be. But at the end, at some point, you get stuck and might need to stop and ask someone that which turn you need to take. You call someone passing nearby, he tells you a turn and you drive further only to find it either a narrow way or dead end or you miss to understand that he told you to turn on first left or second. Result? Stuck at a road, you don’t know, traffic or space, where it might be hard to even turn the car for a new driver like you. Did you get how frustrating it might be? Yes! I have been through it a couple of times. How Nokia Drive helps? Let me tell you one of my recent experience. I was to go Metro hospital in Noida to buy some medicine and prescriptions for father, which I was needed to courier later on. I got the list in noon, then I had series of meetings in office and despite of plans, I got off by 5:30 PM only. I was to reach the hospital before 7:00 PM anyhow and I didn’t knew the way. 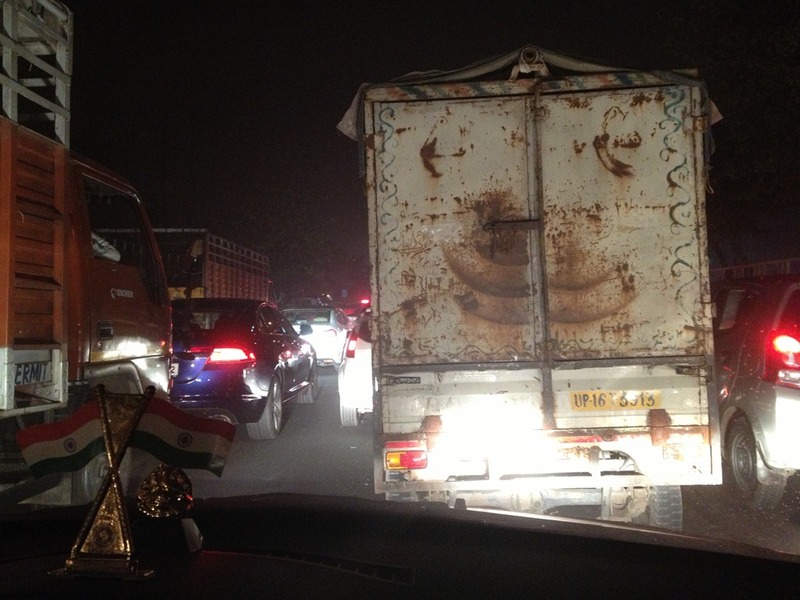 Evening rush at Noida-Delhi border was enough to ensure that one wrong turn and I will certainly loose the time. 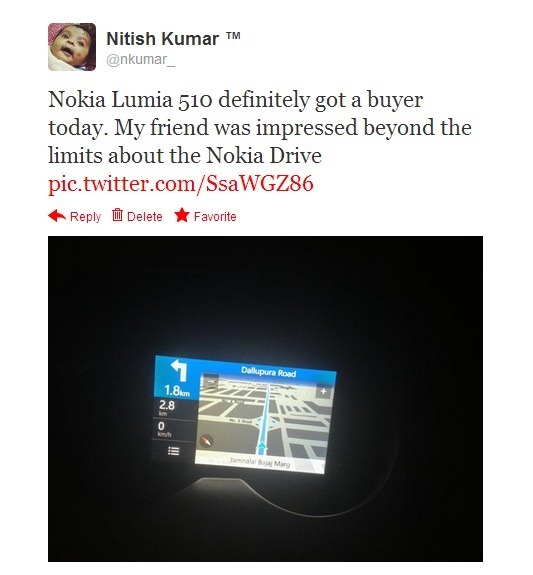 Luckily I had this, this Nokia Lumia 510, the inexpensive review unit from Nokia India to me (cost less than 10, 000/-). 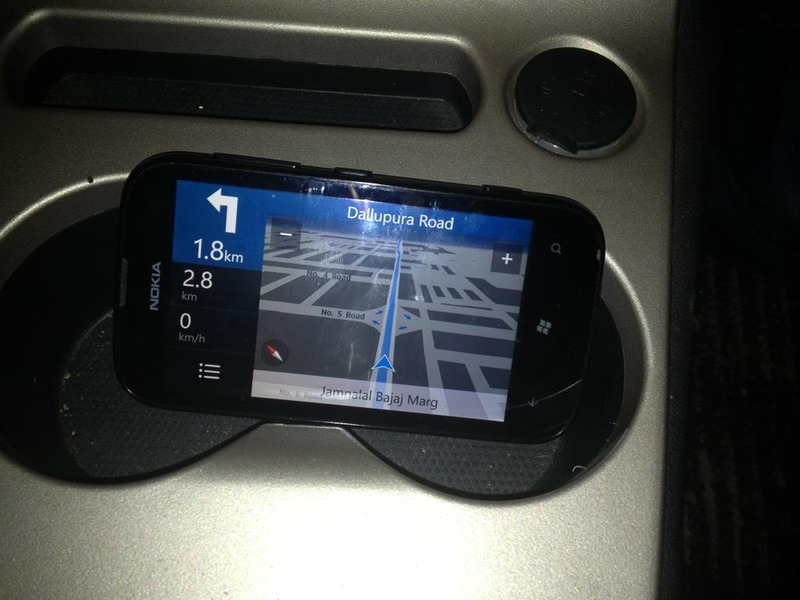 I had many a rides based on Nokia Drive on Nokia Lumia 800/900/710/610, but most of them were been on known routes or on stranger ones with enough time in my hands. I never had a deadline kind of situation till the day when blind faith in tech was only way forward. Yes! I had less faith about a device that costs just 10k. I mean may be crappy GPS to actually get along turn by turn (I tell you I had a very very hard time to get a lock on those Galaxy 3/5 units and some of HTC cheap Android phones). But I really had no options in hands despite of having two of legendary phones with me, Galaxy S and iPhone 4S. Galaxy S luckily got Google Navigation recently, but the experience with that English accent and breaking GPS in middle of road wasn’t a pleasant experience for me. 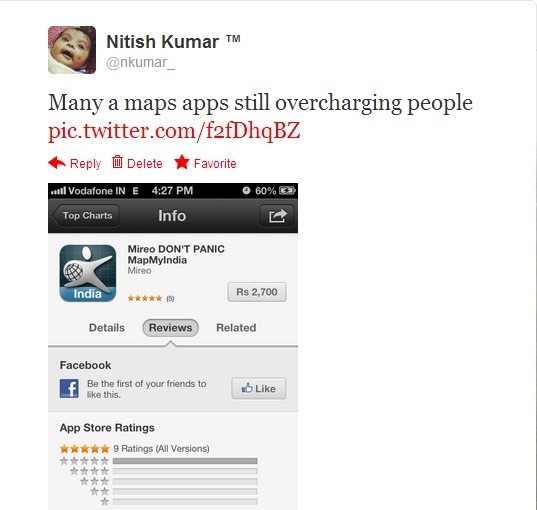 On other hand, iOS6 ridden iPhone 4S just refused to give any navigation for Indian users at all. Guess! What happened at the end? Yes! I made it within one hour I guess despite of frustrating jams on border and so long queues and slow moving traffic. I took a turn when Nokia Drive told me to do so and believe me, I never felt that I drove any bit extra to reach my destination. Two of my friend who visited me in recent were actually agreed about the product in our short wondering around cannaught place, Faridabad and Ghaziabad. One of the friend actually commented that with this device, I actually know Delhi routes better than you. Yes! Its still a less than 10k only device, but considering the fact that its able to do the same what I described above even without a SIM inside, this thing worthy to be part of your life. Do you agree? If you don’t then yes, there are many other alternatives around, if you prefer. 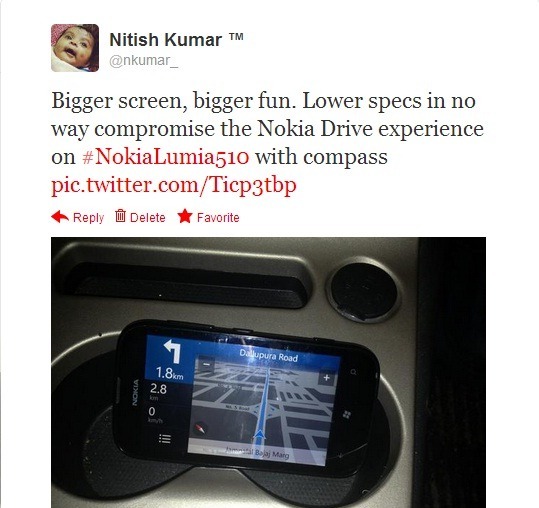 Keep in mind, Nokia Lumia comes up with completely offline navigation experience to you for a cost…. nothing… a free service for lifetime. Competition? What competition? Lowest price point? It may be lowest in Lumia but definitely not overall lowest. 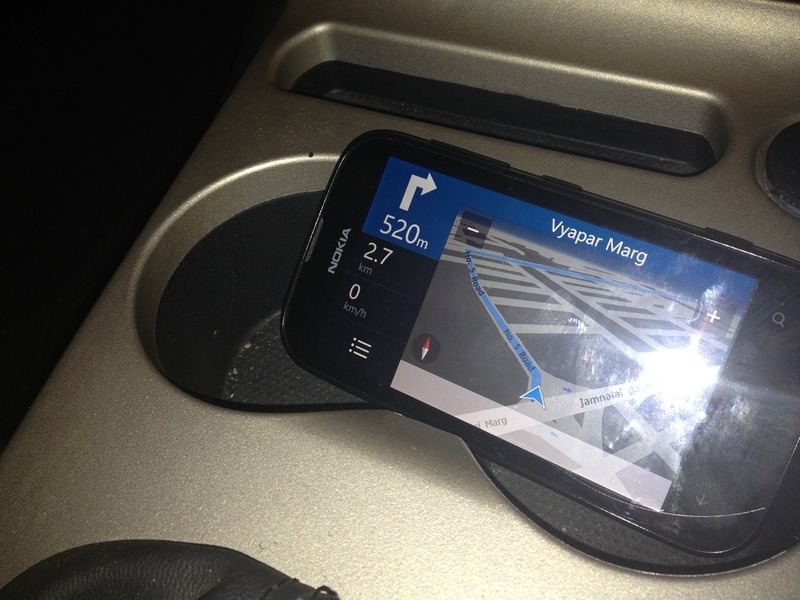 My friend who has been recently gone to UAE and he is using Nokia 500 and he’s very happy with Maps and Drive , completely offline. 500 is lower in cost. And has decent screen. My point is title is not correct factually.